Panaji. January 26, 2019 …. ..The Directorate of Transport has compiled their monthly report of number of accidents that occurred and number of Challans issued for the month of November 2018. As per the report there were 309 road accidents of which 22 Fatal Accidents (North Goa – 11 and South Goa – 11), 21 Grievous Accidents (North Goa – 11 and South Goa – 10), 62 Minor Accidents (North Goa – 23 and South Goa – 39) and 204 Non – Injury Accidents (North Goa – 126 and South Goa – 78) took place. 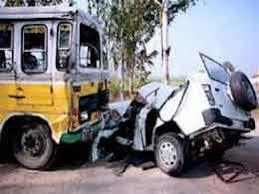 The total number of people who lost their lives in road accidents were 22 (North Goa – 11 and South Goa – 11). 9 riders, 7 P/Riders and 6 Pedestrian lost their lives in these accidents. 24 people were Grievously Injured (North – 13 and South – 11) while 92 persons suffered Minor Injuries (North – 31, South – 61). A total 8820 Challans were issued by Transport authorities in the month of November 2018.